Looking for a weekend getaway from Hyderabad where you can just savour the magic of history and nature? If yes, then it is advisable to plan a trip to the beautiful hamlet of Gandikota in Andhra Pradesh. It is one of the few places in the state which can get you an adrenaline rush. Yes, apart from exploring the beauty of its historical monuments, which are in existence for centuries, you can also indulge in relishing the beauty of nature. The village is located on the banks of the Penna river and has a history dating back to the 12th century. It is one stoppage where you can learn in detail about the bygone era of the Pemmasani Kamma dynasty. So, if you always look forward to finding yourself amid the lanes of history and nature simutaneously, then Gandikota is your sure shot weekend getaway. Read on to find out more about Gandikota and how to reach it. The region in and around Gandikota experiences an extreme climate during the summer season, and hence most of the tourists do not prefer visiting it during the summers. The best time to frequent is from October to February. During this period, the weather is perfectly fine, thereby, letting visitors explore its tourist attractions comfortably. By Air: The nearest major airport to Gandikota is located in Bangalore at a distance of about 250 km. If you desire to travel by air, then you can take a direct flight from Hyderabad to Bangalore and then from there, you can either hire a cab or use public transport to reach Gandikota. By Rail: Kondapuram is the nearest railway station to Gandikota at a distance of about 50 km. You can catch a direct train from Hyderabad to Kondapuram. The journey will take an average time of 7 h.
By Road: Gandikota has a well-maintained road network, and hence it is easily accessible by road. Route 1 is the preferred route for most of the tourists as it takes only 7 h to reach Gandikota while the other route takes an average time of 9 h. On your way, do not forget to take a break at Kurnool and witness its beautiful tourist spots. Kurnool is located at a distance of about 213 km from Hyderabad and 156 km from Gandikota and is famous amongst tourists as a historical place. However, it is also home to numerous natural sites which have been alluring nature lovers and weekend travellers for decades. As per historical records, the town is believed to have been established thousands of years ago. The rock paintings at Ketavaram on the outskirts of Kurnool date back to the Palaeolithic Era. The major places to visit in and around Kurnool include Kurnool Fort, Orvakal Rock Garden and Rollapadu Bird Sanctuary. Gandikota is located in the Kadapa district at a distance of about 390 km from Hyderabad and is a must-visit destination for travellers who look forward to exploring new places and discovering unknown sites. Even though Gandikota has gained immense popularity amongst offbeat travellers over a period of time, it is still an unknown destination amongst common tourists. Following is the list of the major places you must visit to savour the best of Gandikota. If you are a history lover, then Gandikota Fort is your first priority here. It is one place where you can learn in detail about the existence and survival of Gandikota in the past. Here, you can also study the bygone era of the Pemmasani Kamma dynasty. Even though the fort is lying in ruins today, it still attracts hundreds of travellers every year. You can also savour the panoramic beauty of Gandikota settlements from the top of the fort. Even though Gandikota is often referred to as the site of great historical significance, it is popular amongst tourists for its incredible natural beauty, which is present in the form of a grand canyon. It is the place where you can feel the magic of nature. Here, you can soothe your eyes with the enchanting views of the Penna river as it flows through the gorge. Most Read: Do You Know About These Unexplored Hill Stations In Andhra Pradesh? How about taking up a thrilling and exciting activity? If yes, then you must explore the beauty and the majesty of the Belum Caves. Did you know that these age-old caves consisting of black limestone have the largest cave system in the country? Today, Belum Caves have become a popular tourist destination and have been declared as the site of national importance. These caves are located at a distance of about 60 km from Gandikota. Well, this is something you would certainly love to do. 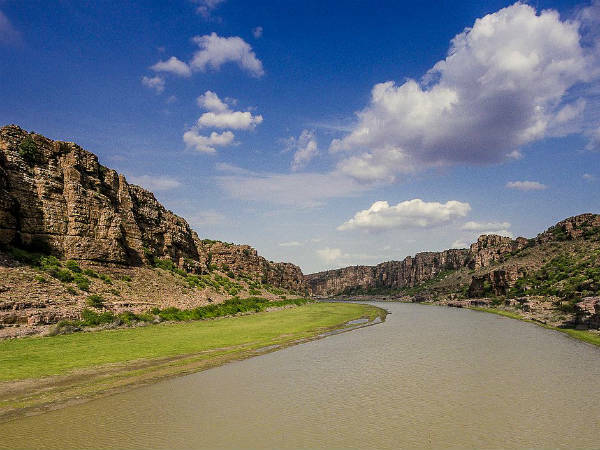 The presence of the Penna river makes it easy for campers to enjoy Gandikota to the fullest. Yes, you can pitch your tents on the banks of the Penna river and enjoy the natural beauty of Gandikota. Other tourist attractions in and around Gandikota include Madhava Perumal Temple, Ranganatha Swamy Temple, Jumma Masjid, Penna River Beach and Ahobhilam. On account of their beautiful surroundings, these enthralling places will certainly interest you.